Learn about disposal and how toxic material can continue to be used in batteries if recycled. Lead- and cadmium-based batteries pose the largest environmental concerns, so much so that nickel-cadmium was banned in Europe in 2009. 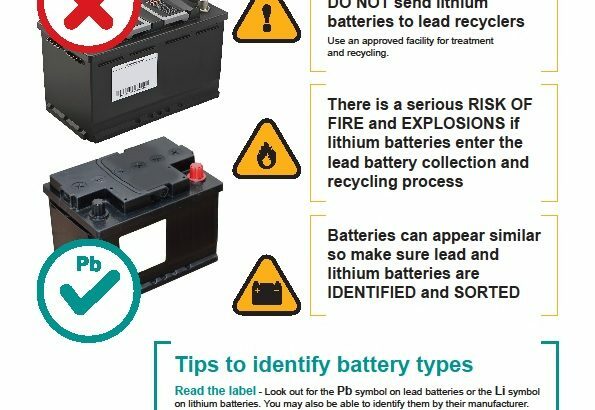 Attempts are being made to also ban the lead-based battery, but no suitable replacement is available as was the case by substituting nickel-cadmium with nickel-metal-hydride. For the first time, lithium-ion has been added to the list of pollutants. This chemistry was classified as only mildly toxic, but their sheer volume requires tighter scrutiny. Lead acid paved the way to the success of recycling, and today more than 97 percent of these batteries are recycled in the USA. The automotive industry should be given credit for having organized recycling early; however, business reasons rather than environmental concerns may have been the driving force. The recycling process is simple and 70 percent of the battery’s weight is reusable lead. Over 50 percent of the lead supply comes from recycled batteries. Other battery types are not as economical to recycle and are not being returned as readily as lead acid. Several organizations are working on programs to make the collection of all batteries convenient. Only 20 to 40 percent of batteries in mobile phones and other consumer products are currently recycled. The goal of recycling is to prevent hazardous materials from entering landfills and to utilize the retrieved materials in the fabrication of new products. Even though environmentally unfriendly, lead acid batteries continue to hold a strong market niche, especially as a starter battery. Wheeled mobility and UPS systems could not run as economically if it were not for this reliable battery. NiCd also continues to hold a critical position among rechargeable batteries as large flooded NiCds start jet airplanes and propel sightseeing boats in rivers of larger cities. Although pollution-free, these batteries are in decline. Find a battery recycling drop off location.